Kroegers Ace Hardware's has been serving the Four Corners Region since 1921. We have the most complete and modern hardware store with over 85,000 items in stock. We have many products you won't typically find in hardware stores. On top of our merchandise we have a wide range of services to make your life easier. Kroegers eclectic kitchen and housewares are a unique addition to the their hardware. They are stocked with upscale kitchen appliances and small appliances. 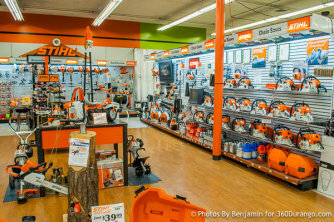 Kroegers is a proud retailer of the STIHL products. Because we are an independent dealer we can provide services the big box chain stores can't match. Our knowledgeable staff is always ready to help you select the equipment that meets your needs. We can offer fast service for your STIHL equipment after you take it home. Your equipment comes fully assembled and ready to use, and our staff can give you a demonstration to get you familiar with your new product. The business philosophy is still to provide a level of service that is unmatched in the industry and continue to be a strong partner in the community through involvement in sponsorships in various groups and activities and always striving to be a good customer service representative to all of our wonderful visitors from all corners of the world. Our knowledgeable staff will help you find what you're looking for or direct you to the place you need to get your project done!